The first effective seismographs were built between 1879 and 1890. In 1885, E. S. Holden, an astronomer and then president of the University of California, instigated the purchase of the best available instruments of the time "to keep a register of all earthquake shocks in order to be able to control the positions of astronomical instruments." These seismographs were installed two years later at Lick Observatory on Mt. Hamilton and at the Berkeley campus of the University. Over the years those stations have been upgraded and joined by other seismographic stations administered at Berkeley, to become the oldest continuously operating stations in the Western Hemisphere. 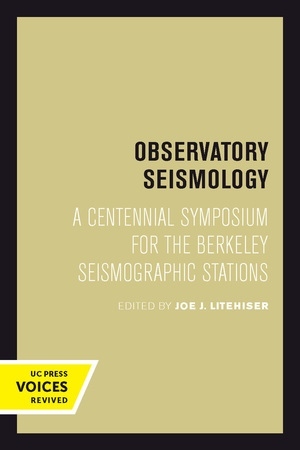 The first hundred years of the Seismographic Stations of the University of California at Berkeley, years in which seismology has often assumed an unforeseen role in issues of societal and political importance, ended in 1987. To celebrate the centennial a distinguished group of fellows, staff, and friends of the Stations met on the Berkeley campus in May 1987. The papers they presented are gathered in this book, a distillation of the current state of the art in observatory seismology. Ranging through subjects of past, present, and future seismological interest, they provide a benchmark reference for years to come. This title is part of UC Press's Voices Revived program, which commemorates University of California Press’s mission to seek out and cultivate the brightest minds and give them voice, reach, and impact. Drawing on a backlist dating to 1893, Voices Revived makes high-quality, peer-reviewed scholarship accessible once again using print-on-demand technology. This title was originally published in 1989. Joe J. Litehiser is lead seismologist with the Bechtel Group in San Francisco.